FM1, a new multifuel power station, is owned by Multifuel Energy Limited (MEL) a joint venture between SSE and Wheelabrator Technologies Inc., is being built on land next to the existing Ferrybridge ‘C’ coal fired power station near Knottingley. Once FM1 is fully operational, which is expected to be late summer 2015, it will be able to produce enough electricity to power around 160,000 homes*. The new operations team, which comprises 46 full time equivalent staff have all now started in their roles, following a successful recruitment process which saw over 400 applications for the operational positions. MEL has applied to build and operate a second Multifuel power station at the site. The level of local interest that has been shown during the recruitment process for FM1 has been extremely positive, and MEL hopes that, if planning permission is granted for a second multifuel facility, it would repeat the highly successful recruitment process that was delivered for FM1. Further information about the Ferrybridge Multifuel projects is available on the website www.multifuelenergy.com or by contacting the project team by e-mail: info@multifuelenergy.com. *Based on the industry average annual household consumption of 3,300 KWh of electricity and using a base load of circa 70MW net export capacity utilised for 8000 hours per annum. MEL is a 50:50 joint venture between SSE and Wheelabrator Technologies Inc. MEL is currently constructing a £300m multifuel generation facility at SSE’s Ferrybridge ‘C’ power station in West Yorkshire – known as Ferrybridge Multifuel 1 – and together the joint venture partnership has a pipeline of UK development projects. SSE is one of the UK’s largest generators of electricity with around 11,700 MW of generation capacity in total (UK and Ireland) from the most diverse portfolio of power stations. It is the leading generator of electricity from renewable resources with a total generation capacity of around 3,400MW. Through its renewable development division, SSE Renewables, it is involved in the development of new renewable energy projects covering wind, wave, tidal, and hydro electricity. Wheelabrator is a world leading energy from waste (EfW) company operating in North America, Europe and China. Wheelabrator is a wholly-owned subsidiary of Energy Capital Partners, an energy-focused private equity firm with over $13 billion in capital commitments. 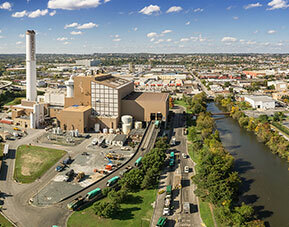 Wheelabrator has developed, owned and operated EfW facilities for nearly 40 years. Today, it currently owns and/or operates 19 energy facilities in the United States, 15 of which are EfW.